Discover campsites of Morbihan France but also over 450 campsites throughout France, offering a variety of rental mobile homes, chalets and accommodation of more atypical as bungalows or caravans, but also leisure facilities such as aquatic areas with sometimes an indoor or well even with heated pool for your comfort, for an unforgettable vacation. Welcome and enjoy your visit in Morbihan (56) with Gulf of Morbihan, Belle Ile en Mer, Atlantic coast. Campsites in Morbihan welcome you to your camping holiday 2, 3, 4 and 5 star or LRP. 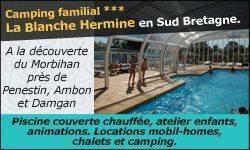 Campsites with recreational facilities (swimming pool, water park, water park, water slides, wading pool, spa, playground, tennis court, multi-sports), entertainment and services (restaurant, bar, food, WiFi access, disabled access, camper services) to make the best of holidays throughout Morbihan. Traditional camping in Morbihan on pitches or rental of mobile home camping, campsites below offer the best camping in Morbihan. 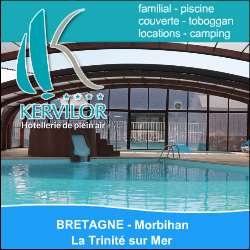 Enjoy the outdoor accommodation and campsites in Morbihan! 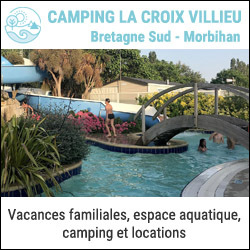 Rental of mobile homes, chalets, bungalows, cottages, Bengali, cottages, trailers, caravans, tipis and camping sites equipped for your holidays in Morbihan, our French campgrounds welcome you everywhere in Morbihan, a favorite camping in Europe. Have a great holiday camping with our campsites in Morbihan! Welcome at Le Village Insolite ! Brigitte and Philippe welcomes you in a convivial and friendly atmosphere on 34 pitches, in a quiet and shady environment, with beautiful surroundings. At 15 min. from the Gulf of Morbihan and 25 min. from the beach, Le Village Insolite offers you, in a quiet and green space, to stay in a Far West caravan (roulotte), a yurt, a tipi, a kota, a boat, a caravan or chalets or just on pitches. Come and enjoy our activities and services as well as our heated indoor pool. See you soon at Le Village Insolite ! ! Camping du Haras offers rentals for children's happiness and well-being of adults. You will find several amenities such as water park, indoor swimming pools, water slides, spa with relaxation pool, sauna, steam room, massage room and gym, recent and heated bathrooms, laundry facilities, a bar, a large games room and everything you need for an enjoyable relaxing holiday. Near Lorient in Morbihan, discover Le Flower camping LA POINTE DU TALUD, our 3 star campsite on a human scale in South Brittany. The campsite is located in Ploemeur near LORIENT facing the Ile de Groix, and offers MOBIL HOME RENTALS, pitches for tents, caravans and spacious Camping Cars. The campsite is equipped with a COVERED POOL heated with water at 28°c for a swim whatever the weather! 300 m from the sea and the beach, next to the coastal paths, lovers of walking or cycling (voie Verte) and fishing, this place is for you. On the spot you will have a ground of Petanque and a new Mutlisport ! hiring of bicycles, Bar/Spicerie/Pizza-Frites-Ice/Bread/Dailies. Entertainment for young and old in season, and a brand new playground! Wifi in the field. Discover nearby: shops, diving and kayaking. Many tourist sites "La Cité de la Voile", "Le Zoo de Pont Scorff"... we hope to see you soon camping from Morbihan to Pointe du Talud! Camping Morbihan by the sea with swimming pool, camping L'ATLANTYS 3 stars, welcomes you in Ploemeur in South Brittany near Lorient. With our seaside campsite, you can also enjoy the heated swimming pool in season. And for your stays or holidays, the campsite offers you the rental of mobile homes, unusual accommodation such as the coco sweet, residential pitches, and of course traditional camping pitches. On site playground for children and adults. Around the campsite, you will have the choice to discover wonderful sites like Lorient and its Interceltic festival, the Isle of Groix, the alignments in Carnac, Quiberon...See you soon for iodized seaside holidays in camping du Morbihan. Camping 2 stars of Morbihan near the seaside, in South Brittany. Welcome to the campsite La plage des Granges, in Billiers, 300m from the sea. Fishing, swimming and hiking are common activities. Discover a family and quiet campsite, with its friendly atmosphere. In this campsite in South Brittany, we offer naked pitches for caravans, tents or camper vans as well as the rental of fully equipped mobile homes for one night. We offer passing camper van drivers a package for one night. Enjoy your holiday at camping Morbihan. 3 star campsite in Belle Ile en Mer in the Golf du Morbihan (56), in South Brittany. Welcome to our Camping Les Grands Sables, located in Locmaria on the largest of the Breton islands. For your holidays or a short stay among us, let yourself be tempted by a rental of mobile homes, bengali, caravan or tent. For the pleasure of all, enjoy the sea just 300 m from the campsite, and the beach and numerous water activities for relaxing moments with family or group. The campsite is open from April to September. come and discover the camping La Croez Villieu at the sea-side, with 7km of beach and 400 hectares of dunes. You can take a walk on the lane of megalithes, visit the dolmens and the monuments like superb chapels. The most sporting will enjoy going into the 80 km of resort, mountainbiking, marching.The camping is situaded at Erdeven, in Morbihan, near the Ria of Etel,quiberon and Golfe of Morbihan. The campig La Croez Villieu is situated at 800m of all shops and nearby activities (tennis, golf,mini-golf,yacht-club,horseriding..)A guarded sandy beach is with in 2 km. In the camping you can find cover swimming pool, jaccuzi, hammam,and out-door swimming-pool with a slide. Etel, at the mouth of the Ria d'Etel, is a haven of peace. You will find all you need here for a very enjoyable stay : restaurants, bars,boat trips, marina, etc. Auray, a bustling market town. Do not leave without a visit to the old St Goustan quarter (Auray'harbour) with its timbered houses. Alsoin Auray, the hero Cadoudal's mausoleum. Carnac,The parish church, and ancient history museum. The standing stones, St Michel Tumulus,and archeoscope. Riding stables. Indoor swimming pool at the "thalassotherapie" . Plouharnel: the "musee de la chouannerie". Locmariaquer (10kms):Standing stones and "tables des marchands". The entrance to the Morbihan Gulf is here. Embark here aboard the "angelus" for a boat trip round the gulf, its islands and the Auray River. Vannes: A historic town with its medieval quarters, its remparts and cathedral. A modern town too, with the parc du golfe, where you will find an aquarium, butterfly house and a clockwork museum. Camping les Druides is a family campsite ideally located near Carnac’s beaches and the famous standing stones. Our campsite is the perfect choice for families with young children and for those seeking tranquillity. The campsite offers a heated outdoor pool and paddling pool as well as a multisport court for sports enthusiasts and a games room with a TV. Our younger guests will love the outdoor play area : bouncy castle, slide, roundabout… Our 112 pitches, set within a 6-acre park, are spacious and surrounded by trees. We also offer the hire of comfortable homes all equipped with a bathroom. For over 40 years we have offered a peaceful and tranquil setting for a relaxing holiday ; we do not organise any entertainment but there are plenty of outdoor activities on-site to keep you amused ! In southern Brittany, 600 metres from the Gulf of Morbihan Camping de l’Allée welcomes you from 1 April to 30 September 2017. This 3-star family friendly campsite, set within a 7-acre park, offers 162 sunny and shady pitches bordered by shrubs and trees including 36 mobile homes, 2 canvas tents, a heated pool and numerous services. Activities for all ages Camping de l’Allée opposite Ile aux Moines and just a few minutes from VANNES, is the ideal base from which to explore the Gulf of Morbihan and to enjoy a spot of sailing, diving, watersports, fishing, hiking, sunbathing and so much more… ARRADON town centre offers all the shops and services you need and there are plenty of markets and events taking place in the area too (fest-noz, fest-deiz, wheat festival…). See you very soon. Tourism and heritage in Brittany VANNES, the capital of the Morbihan, is located nearby. Visit this town of art and history, its historic centre, wash houses and ramparts as well as the aquarium and butterfly park. The marina is also the departure point for excursions around the Gulf. Festivities : historic festival, Arvor festival, jazz festival… Hiking trail in the Morbihan The GR34 hiking path is located just 600m from the campsite. We can give you a list of all the walks and hikes in the area so don’t hesitate to ask us for details, we will be only too happy to help. 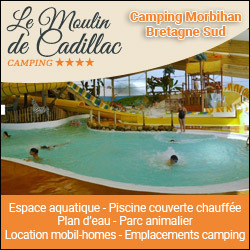 Welcome to Camping Le Moulin de Cadillac, a 4-star campsite in Morbihan. Our campsite located in South Brittany, offers various hiring of mobil-home or chalet. The campsite is equipped with an aquatic space with heated and covered swimming pool, but also traditional pitches for your stay in tent, caravan or camper. Many activities have been proposed in season, and access to the lake will delight the fishermen. 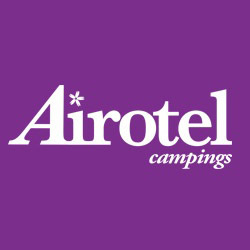 We offer a wide range of rentals, uncommon models, comfortable or even just camping pitches if you drive your own caravan. If you're looking for a perfecly suitable site for you: make up your choice between camping Le Moustoir and Camping Le Lac. They are both Camping Cheque sites, small campsites. 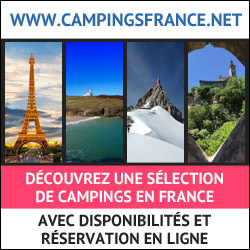 Camping du Morbihan en Bretagne, le Camping les 7 Saints est un camping 5 étoiles à Erdeven qui vous accueille pour vos vacances camping et location de mobil-homes en Bretagne sur la côte atlantique.